A Tribe Called Condon: 32 weeks or 34 weeks??? 32 weeks or 34 weeks??? By now, your baby weighs 3.75 pounds (pick up a large jicama) and is about 16.7 inches long, taking up a lot of space in your uterus. You're gaining about a pound a week and roughly half of that goes right to your baby. In fact, he'll gain a third to half of his birth weight during the next 7 weeks as he fattens up for survival outside the womb. He now has toenails, fingernails, and real hair (or at least respectable peach fuzz). His skin is becoming soft and smooth as he plumps up in preparation for birth. 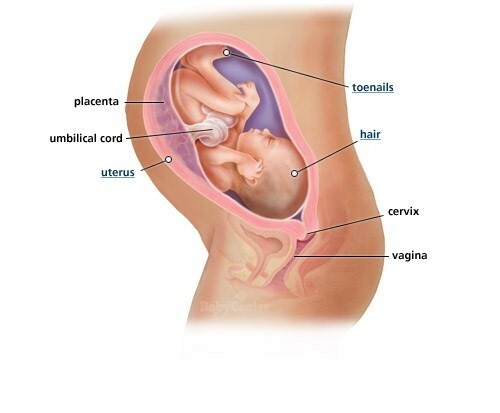 The image and baby info above describes the baby at 32 weeks. However, after today's doctor visit, we very well could be 34 weeks right now. During our last couple of doctor visits, my fundal measurement has been measuring big, about a week or two ahead. Today, Dr. Thatcher said we are measuring 2 weeks ahead. When we return in another couple of weeks, and if we're still ahead, she is going to order an ultrasound to see if we have a "big mamma jamma" in there (her words exactly). Bring on the ultrasound! We never get bored seeing him. This excites both Rich and I because we are both so darn anxious for Spencer's debut. I am secretly wishing he's measuring big. Although, this whole time we both kind of had a feeling he was a big boy because a couple of different ultrasound technicians commented on how large his hands and feet were. Plus, my estimated due date was not based off of my last menstrual cycle. If... we were to base our due date off of my last period, Spencer would be due on Mach 30th. I don't think he'll come that early, but maybe within that next week. We'll find out a lot more at our next two appointments. Dr. Thatcher will be checking his position, we're hoping for head down, and she will also guesstimate his weight at that time. This whole week Rich and I have been busy trying to organize the baby's room, wash his clothes in the fragrance free detergent, and also pack our two hospital bags. Speaking of the room, it is complete with the exception of the mobile and wall art... still. I'm actually starting to become a little frustrated because I've been working with the Etsy seller since December. I want to have the room 100% complete so I can share photos with you, and of course so it is all set when he is finally introduced to his new world. Stay tuned on the nursery.